This is what happens. 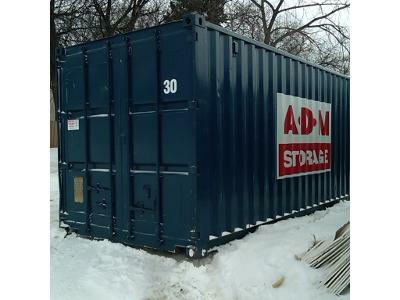 3-4 weeks before Passover starts, we get a train container delivered to our parking lot. We never really know when the first orders will be delivered, but we ask the distributors to aim for 3 weeks before. They'll continue coming for 2 weeks. This year, the first shipment came 4 weeks before and just like that, 13,000 lbs. 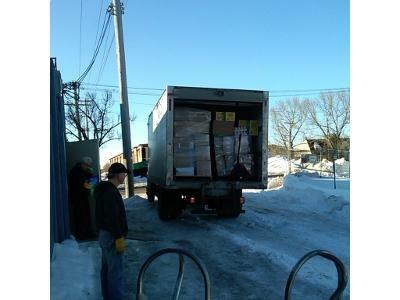 of Passover products were delivered -- a lot of matzo in this truck. 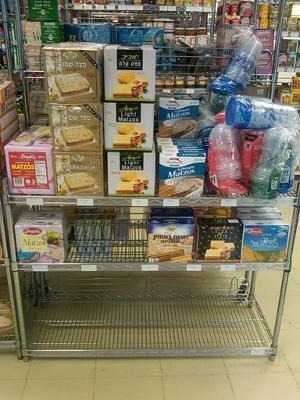 At this point I start panicking and we work like crazy to pack everything up in the store that's not kosher for Passover and get the racks set up for Passover. 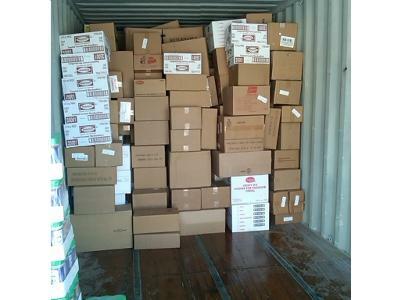 First thing out is the matzo -- I'm going to guess that we get close to 3,000 lbs of matzo in. 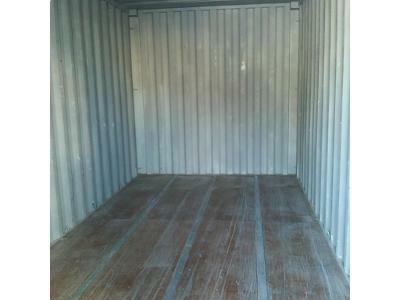 You can't see the cases stacked across from this shelf, the stacks in the storage room and the stacks in the train container. What didn't I do so well with this year? Anybody need some potato chips? So all the old delicatessens are gone, Myer's, Phil's? Surely there were more. Do you find a growth or decline in how many people in the area are keeping kosher or how strictly they are keeping it? Myers is still around as are some others, but none of them are kosher. Overall there's been a decline over the years -- if not, there'd be more kosher business here. The Jewish population here declined in the 80s and 90s -- a lot of people moved to Toronto, Vancouver, the USA, etc. But in the last few years we've seen people starting to return (Winnipeg got through the financial downturn in much better shape than most places). There is also a growing community from Argentina and another from Israel. And it's interesting to see that some younger people who grew up in non-kosher homes have decided to keep kosher. When that happens the parents often start keeping kosher (or at least trying) so that their children and grandchildren feel comfortable eating in their homes. We're constantly seeing new people in the store, which always surprises me. 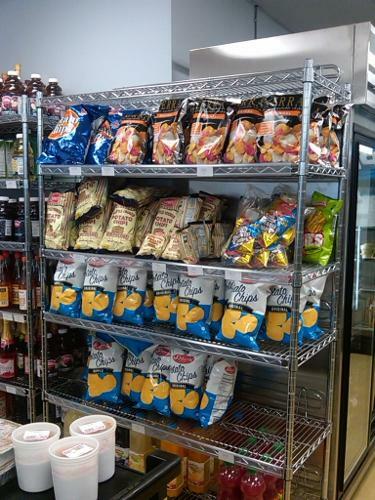 But some of them are new to the city, new to kosher or they don't keep kosher but come in for specific things. A lot of our Russian/Israeli customers don't keep kosher but want all of the Israeli foods we bring in. It's interesting -- on any given day in different corners of the store you can here English, Hebrew, French, Spanish, Russian and Yiddish. Frittata full of vegetables (potato, red onion, zucchini, mushrooms, grape tomatoes), a little feta cheese and a couple of pinches of chopped fresh oregano. 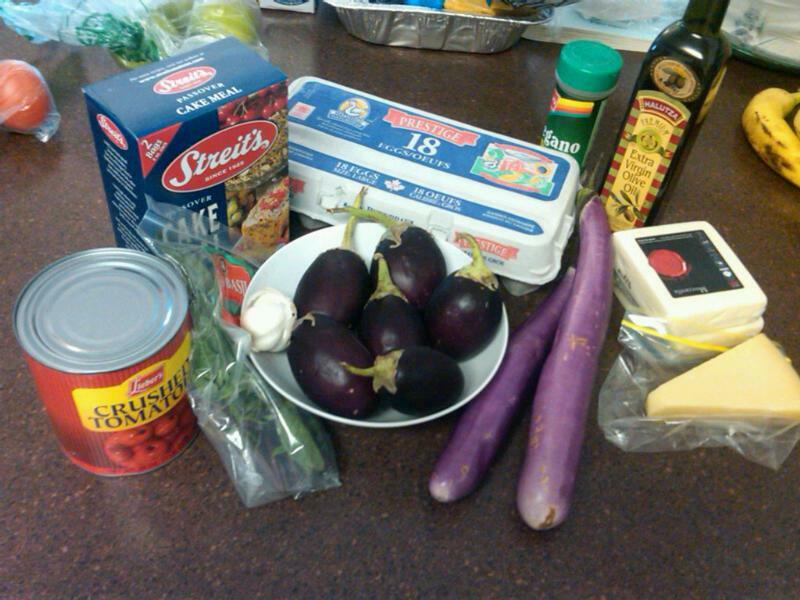 I wanted to make something with eggplant, maybe eggplant parmesan, but these are the only eggplants I could find (a customer reported that she checked all three of the large grocery stores in our neighbourhood on Thursday and none of them had large globe eggplants). They aren't bitter are they? I'm off in search of kitchen stools. I'll take pictures if I see anything promising. I've used those before. I think they're pretty good. Not as good as the long, skinny ones, IMO. They are a bit more....pulpy??? I sliced and salted mine and let them sit for a while to get some of the moisture out. That lemon meringue pie with the coconut crust is a dessert that will stay as a strong happy visual in my mind - and I am not a sweets person. Beautiful. From your photos and narrative I am getting a real sense of how comfortable and natural the cooking techniques are to you. I love watching that "in action". This has been another fascinating look into another kitchen and a store too. I had no idea you had such a big business going on there. The ordering, the unloading, the stacking, the ORGANIZING.....the cooking and baking. Thanks for the look into your food life. Pam, I am lost in admiration for how you make so much work look so easy. And I am seriously craving yesterday's dinner of latkes, lamb, and lemon meringue pie. Pam – I am thoroughly enjoying this week with you. I love that you work with your family – this would be a dream come true for me, especially if it centered around food. I am just amazed at your stamina – a week like this one with the added work of a blog and on top of all of that you are actually cooking at home, too! My heroine! I, too, covet access to a band saw. After brunch I did go looking for kitchen stools and I found some! Ordered, but I forgot to take pictures. By the time I got home it was lose to 6 PM and I didn't have the time (well, ok, the patience) for salting and waiting on the eggplant, so I just dived right in. Sliced the eggplant then dipped into cake meal seasoned with salt, pepper, paprika and oregano. The into an egg wash seasoned with salt, pepper and a little grated garlic. Back into the cake meal. Fried until golden brown and drained one paper towel. Simple sauce: crushed tomatoes, salt, pepper, olive oil, fresh garlic and lots of fresh basil. 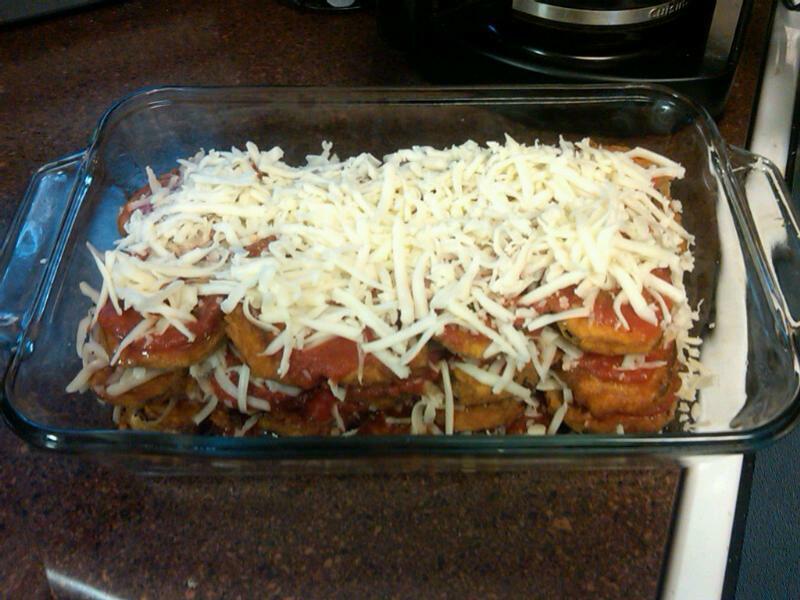 Layered: eggplant, sauce, Parmesan, mozzarella, repeat. Into the oven until cooked through, melted and golden brown. Ate with a simple salad with a red wine vinaigrette. 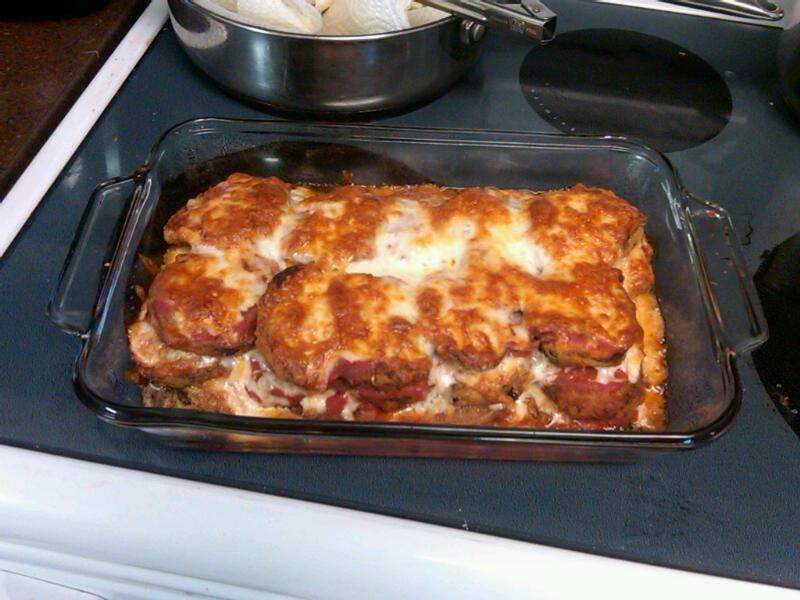 Oh, I only used the small globe eggplants -- they were great! In fact, less seeds than the larger ones, firm flesh and not at all bitter. Thankfully, these were not pulpy. If I was doing something other than breading and frying I would have salted them -- but they were good as is. Phew! It was nice having a 'lighter' dessert. 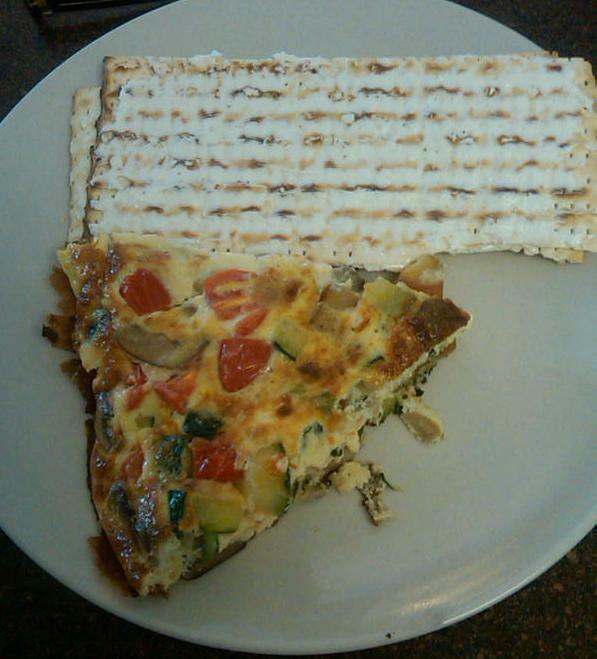 Things made with matzo have a reputation for being heavy -- this was a great option. And the crust was very nice, though it's so easy to make macaroons making a crust from scratch wouldn't have taken long. Ah, I was wondering about the delis, thanks for clearing that up. Sounds like you are providing a great community meeting place. 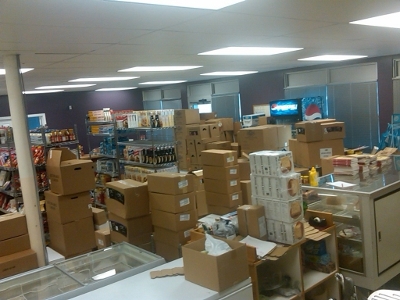 Oy, we've already started talking about how we have to put the store back together when we re-open on Wednesday. 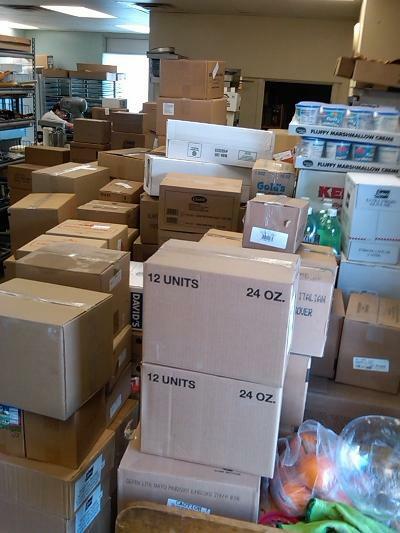 All that non-Passover stuff that was packed away has to be re-organized and I have to start getting orders in! Thanks, Linda. I'm glad it looks easy, but I fell asleep for an hour after dinner. And I didn't even realize there was alliteration in last night's dinner. I think that may be how I plan meals from now on! Aww. Thanks for your comments, Kim. When I came home from university (I went to the U of Minnesota) I got a job working in a restaurant. After working eight 12-14 hour closing shifts in a row without a break (instead of the 4 I was told would be the max) I decided that if I was going to work my guts out, I should be doing it for the family business. It can be tough -- we're all bull-headed, but I've never regretted the decision. It is. We just expanded this year and are trying to figure out if we can put a couple of tables and some chairs in so people can grab a quick bite and sit and schmooze. My mother has promised to cook dinner tomorrow night - a dish she tries to make once every year. That's as far as I've gotten -- thought I think it might be time to back something. We'll see how things look in the morning! I have so enjoyed being in your world this week; I've learned so much about kosher/non-kosher cooking from you and your blogs. I am not doing as much Passover as in previous years; my chef friend moved on to a kosher catering company so he can't use my company but we stay in touch. 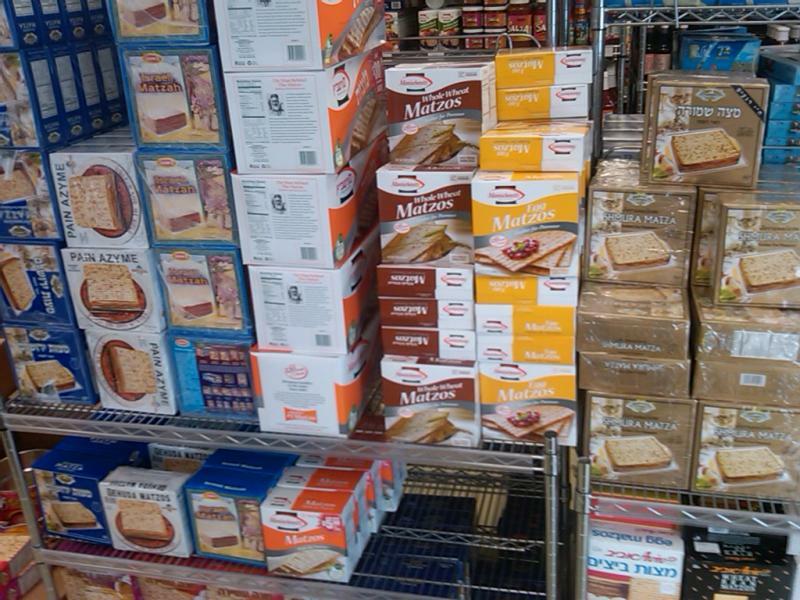 There's been a huge influx of Passover items brought in by a local supermarket chain - stuff you couldn't get even three years ago (carrot cake mixes?! KfP confectioner's sugar - so now I can make meringues!) is on the shelf so I think a lot of people are doing things at home now that so much more is available. We've had a great week with you; hope you have had a great week with us! 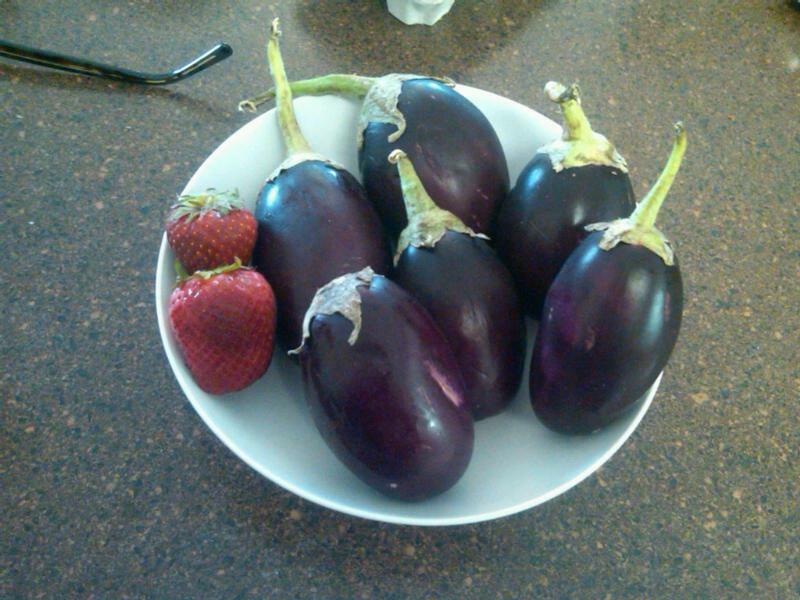 Pam, those kind of aubergines (eggplants) are often available in Asian stores. They are perfect for stuffing. Oh. . stuffing. That would be great. I'll have to play around with them later. Thanks!